In our increasingly fast-paced and stressful world, it seems we are called to accomplish more and more in less time. That may go for many of us in our employment situations as well. As employers and contractors continue to downsize and become leaner, many employees find themselves performing more work, or work of a different nature than what they had previously been required to perform. And some of these employees experience on-the-job-stress as a result. At JAN, we get many calls concerning stress on the job. Some employees ask for a stress-free job as an accommodation, and we have employers and contractors who ask how it can be accomplished. This is actually a really good question! How does a contractor or employer remove stress from a job? And what does that really mean, anyway? Stress by itself is not a disability under the ADA. Many jobs can cause stress for individuals with and without disabilities. Stress is defined by The American Institute of Stress as “the non-specific response of the body to any demand for change.” Who can't relate to that? Is there anyone who hasn't experienced stress at one point or another due to job issues, family or financial burdens, or health concerns? The stress-free workplace is elusive, maybe even nonexistent. So where do we start? The first step in reducing or eliminating stress in the workplace is to look at exactly what is causing it in the first place. Stress is difficult to define because it is so different for each of us. There may be as many reasons or causes for stress as there are employees in any given workplace. No two people will have the same exact stressors. A conversation with the employee will always be necessary in order to define the stress he is experiencing in his job at that time. When we look at all the things required in the workplace, we can understand how stress plays into it. We have responsibilities, expectations, deadlines, supervisors, clients, customers, co-workers, commutes, and the list goes on. We often feel stress when we are out of our comfort zone, but a little bit of stress actually helps teach and motivate us. It might push us to be productive or strive to meet our goals. However, too much stress is the enemy of job performance. Stress can be distracting and it hijacks attention. With this in mind, consider how reducing workplace stress can help all employees be more productive, whether a disability is involved or not. But employees with disabilities, particularly anxiety disorders, may be unable to cope with and manage those stressors without accommodations. So if an employee states that the stress of the job is an issue, the contractor would want to start the interactive process to see if there is a medical condition that may qualify as a disability under the ADA. Then they would look to accommodating the limitations associated with the disability. Individuals with anxiety describe feelings of anticipating the worst and being watchful for signs of danger, or of being on high alert. Anxiety is an ever-present medical condition in our current world. Anxiety, as defined by the National Alliance on Mental Illness (NAMI), is when feelings of intense fear and distress are overwhelming and prevent us from doing everyday things. Anxiety has both emotional and physical symptoms. The emotional symptoms include feelings of apprehension, dread, tenseness, jumpiness, restlessness, and irritability. Individuals with anxiety describe feelings of anticipating the worst and being watchful for signs of danger, or of being on high alert. The physical symptoms include a pounding or racing heart, shortness of breath, upset stomach, sweating, tremors, twitches, headaches, fatigue, and insomnia. It is estimated that 18% or 40 million people in America experience an anxiety disorder that includes social anxiety, panic disorder with or without agoraphobia, obsessive compulsive disorder (OCD), post-traumatic stress disorder (PTSD), and phobias. The symptoms of anxiety may truly be problematic on the job. Some of the greatest difficulties employees with anxiety have in the workplace include attending work consistently, sustaining concentration, experiencing fatigue and maintaining stamina, remembering tasks and procedures, staying organized, managing stress and emotions, managing time and completing tasks, and sleep disturbances. There may also be a greater degree of difficulty with co-worker interactions and working effectively with supervisors or managers. Some employees with anxiety disorders are also affected by panic attacks. 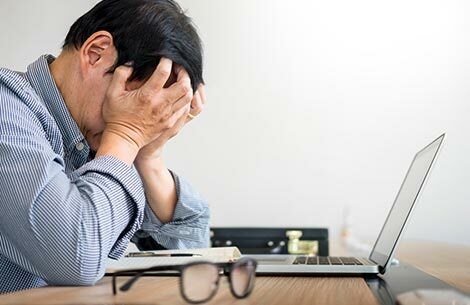 Let's look at some specific examples of employees with anxiety disorders, their difficulties on the job, and the accommodations that might be necessary in order to help reduce stress and anxiety in the workplace. Juan is a help desk employee whose main job functions are troubleshooting the problems of other staff members. He is highly competent in solving problems, but became impatient, rude, and disrespectful to co-workers who contacted him for assistance. After a discussion with the employee that led to an interactive process, the contractor instituted a new policy that allowed Juan to take requests for help by email instead of in person or by phone, reducing the stress caused by face-to-face interactions with co-workers. The accommodation enabled Juan to keep his emotions and behavior in check. Tameka, who has been traveling as part of her job for years, abruptly tells her employer that she can no longer do it: travel is just too stressful. After much discussion during the interactive process, the contractor finds that Tameka has an anxiety disorder that has intensified. The cause of the stress? Tameka feels she can no longer drive a rental car in strange cities. As an accommodation, the contractor will now look to provide transportation for Tameka in alternate ways. Jimbo reports to his supervisor that he has been having trouble concentrating due to an increase in his anxiety. When his supervisor asks Jimbo how he can help, Jimbo produces a list of things that he has been thinking about that may really help reduce his stress and anxiety and in turn increase his ability to concentrate. His list includes ideas to reduce the distractions around him, including allowing him to report to work an hour earlier so that he can come in and get a good head start on his work before his co-workers come in and the noise level rises significantly. He also asks to wear noise-cancelling earbuds and to be permitted to work from home when he is particularly stressed by a tight deadline. Marguerite is a real estate agent with a very busy schedule that exacerbates her stress and anxiety, having a profound effect on her ability to remain organized. Marguerite tried to organize her paperwork in different colored notebooks, one for each of her many clients, but was unable to keep track of them all. She either forgot them and had no paperwork when she met with her clients, or she was caught shuffling through a large number of notebooks in the trunk of her car. As an accommodation, Marguerite's existing system was streamlined by using one large binder with colored tabs. This helped her separate and keep track of each client's specific paperwork, yet enabled her to keep it all in one easily accessible location. A key in the front of the binder listed clients by color. Leo is a woodworker with an anxiety/panic disorder who experienced recurrent panic attacks when traveling during peak traffic times. He was required to order and pick up supplies when necessary. Leo was accommodated with a schedule that gave him the opportunity to drop off and pick up materials when coming to work in the morning. Robert is a counselor with mental health impairments who had been having difficulty with organization and time management after moving to a new position in a more stressful, fast-paced environment. He was struggling to keep track of meetings and complete paperwork in a timely manner to ensure he was meeting his deadlines. As an accommodation, Robert's supervisor helped him set up alerts in his digital calendar to remind him of upcoming meetings and deadlines. A color-coded filing system to help Robert keep track of specific documents and when they needed to be completed was also set up. These accommodations allowed Robert to prioritize what needed to be done and to work more efficiently. Lucy is a paralegal who had been carjacked several years earlier. She experienced significant anxiety concerning commutes after dark. This caused difficulty concentrating, irritability, and inappropriate interactions with co-workers, all of which greatly influenced her ability to work effectively and be productive. Lucy was accommodated with the ability to have a support animal at work and a flexible schedule with work from home during periods of minimal sunlight. Will has pseudobulbar affect (PBA) as a result of a stroke. One of the effects of PBA is a heightened level of emotional reaction. Stress in the workplace often exaggerates Will's emotional response. He often breaks down in tears at inappropriate times and would like for his department to be educated on PBA. He requests disability awareness training for his co-workers. Will's supervisor fully supported him by allowing the time and opportunity for the training, but required that the information should come from Will or from a qualified person he would designate. Will jumped at the opportunity to share information about how his PBA affects him, what he finds to be difficult, what he needs in order to succeed, and how others can assist him in that process. Petra is a human resources manager who has difficulty attending impromptu meetings where she was expected to address specific issues raised in the meetings. Her absences were mounting as she left work to avoid the meetings. After a discussion with her manager to determine what caused Petra so much stress that she had to leave the building, accommodations were put into place. Petra was provided with scheduled meetings and an advanced organizer or agenda for each meeting so she could be aware of issues likely to surface and be better prepared to address them. As you can see from the examples shared here, stress and anxiety are not uncommon in the workplace and can profoundly affect an employee's ability to complete the essential functions of his or her position. So what is a contractor to do? Open communication about what causes stress and anxiety in the workplace is the most direct and effective tool for handling the issues that arise and getting employees back on track to competently and productively fulfill their workplace assignments. As always, feel free to contact JAN for assistance in solving workplace issues.